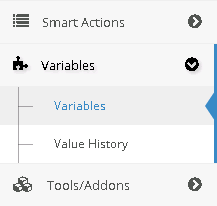 The Variables item can be found between the Smart Actions and Tools/Addons item, on the left-side menu. The Variables are server level variables that can be called in the scenes. 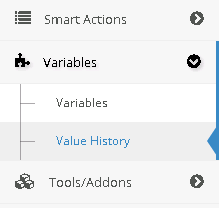 The Value History item can be found between the Smart Actions and Tools/Addons item, on the left-side menu. Value History menu is usefull to see the previous values of your variables. It's simple to use: just select all or one variable, choose the time interval and click on Find. The result will be displayed in the table below.